This post has been sponsored by Sakura of America. 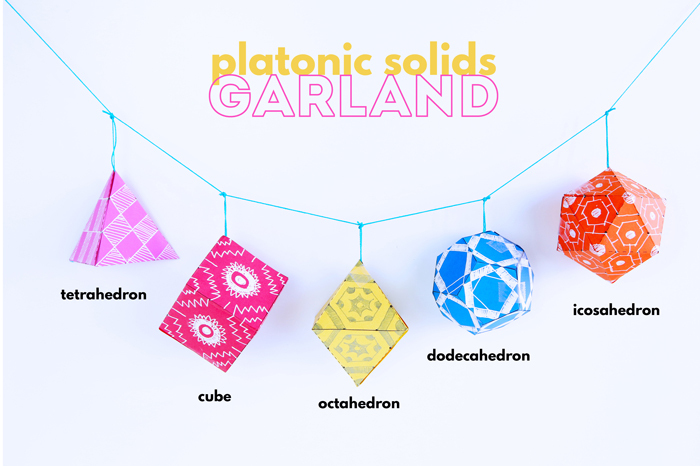 Let’s talk platonic solids shall we? Say, what? Okay let’s talk 3D geometric shapes, does that sound a little less intimidating? If you have a math teacher in your life as I do (my brother) by then end of this project you can wow them with your knowledge of the unique polyhedron we call platonic solids, all by doing an art project. How’s that for some math fun? And don’t worry, I’ll explain what all of these ten-dollar words are too! Today’s project is sponsored by Sakura of America, one of my favorite art supply manufacturers. They just added two new white pen sizes to their Gelly Roll series and I had the chance to test them out in this project. 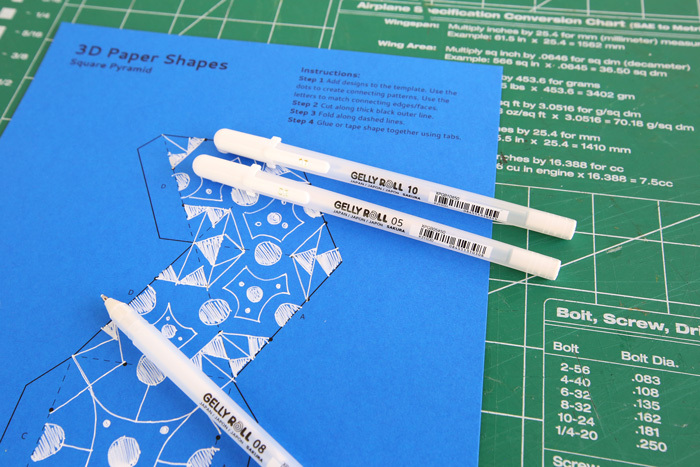 They look incredible on colored paper and add a really unique touch to hand decorated paper crafts. You can learn more about this fab collection of white pens here. 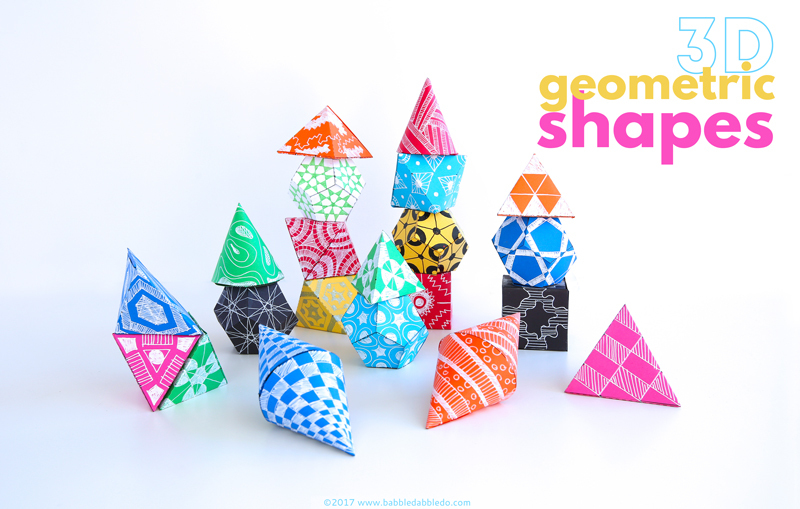 This project started as a simple decorated 3D geometric shapes project but once I learned about the wondrous world of platonic solids I couldn’t wait to geek it out a little more! 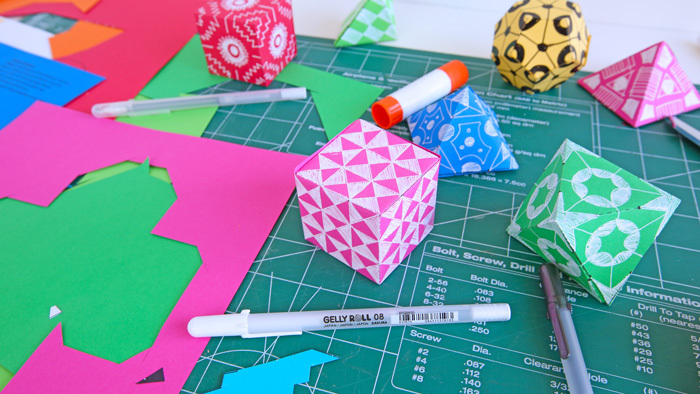 Needless to say even if you don’t learn the math you’ll end up with some lovely paper blocks, perfect for geometry class or holiday ornaments. You be the judge! 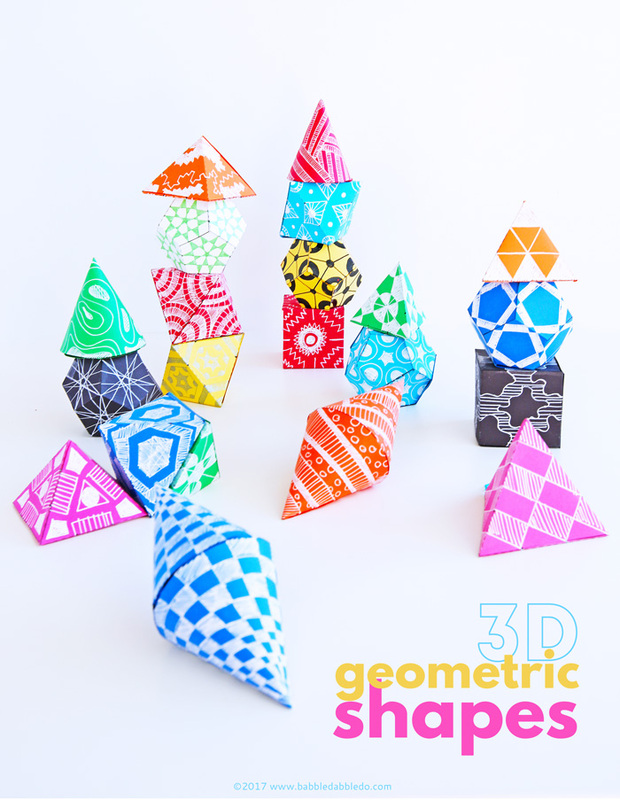 I also included a couple regular old 3D shapes in the templates, you know things like cones and pyramids, they also look fab in this collection! 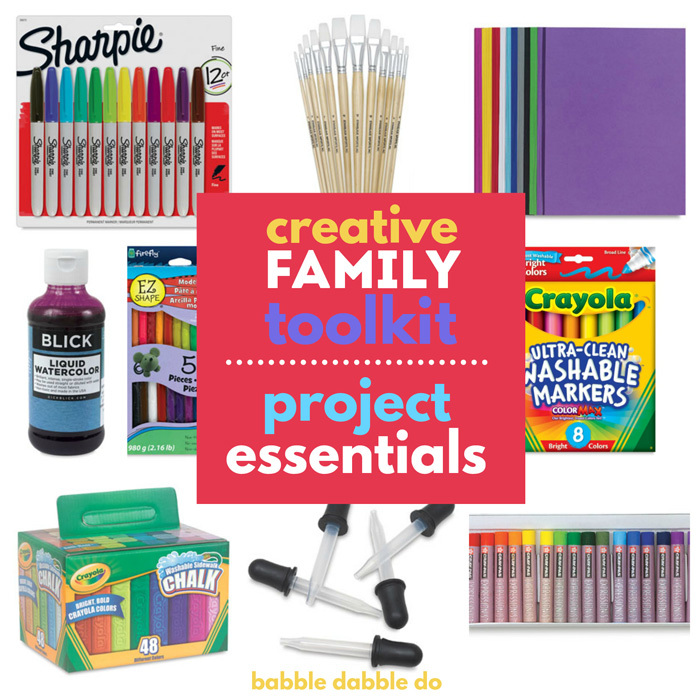 Step 2 Add designs to the template in white or colored pen. Use the dots to create connecting patterns. Use the letters to match connecting edges/faces. Step 3 Cut out the shape along thick black outer line. Step 4 Fold along all dashed lines. Be sure to create a good crease at all folds. Step 5 Glue or tape the shape together using the tabs. Toothpicks make the best tool for rescuing edges that have been pushed in too far when gluing. They also work to hold edges firmly in place if you need to tape them together. 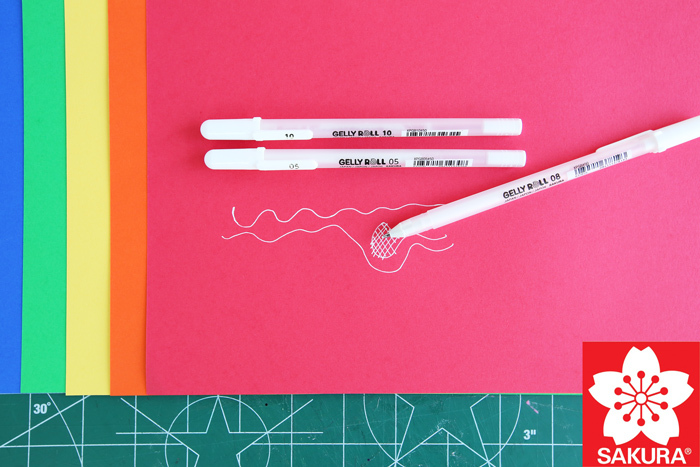 When using light colored yardstick like white or yellow, switch to some Gelly Roll colored pens. Their Stardust series shimmers in light and looks amazing on paper crafts! When creasing the cardstock, it helps to run your fingernail along the edge to create a crisp fold. Open the tabs back up after folding and before gluing. This will make them easier to glue to an adjoining face. 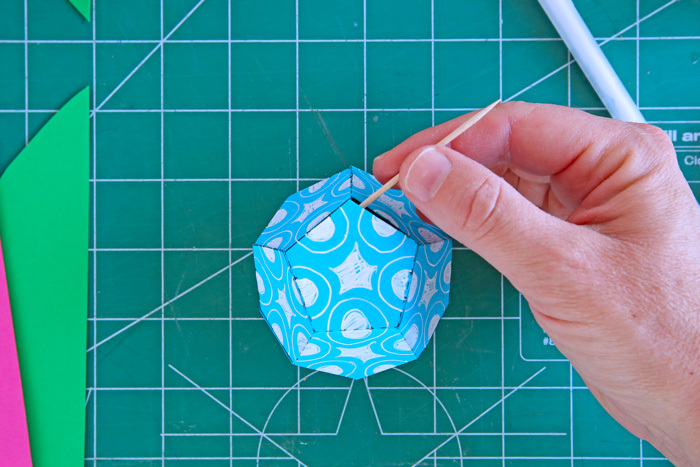 The dodecahedron will be the most challenging to glue together. Tape and a toothpick will be your friend for this! Step 2 Either before or after your have glued your shape together insert the paper clip into the shape. 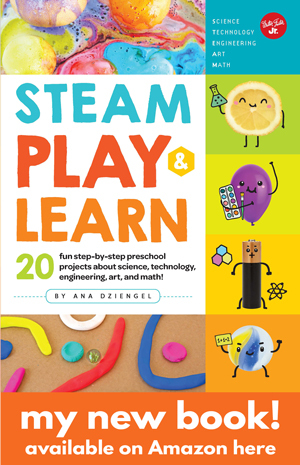 Finish gluing the shape or if already glued push the paper clip into the geometric shape until you feel it catch against a tab edge. Make a garland…a geeky one! 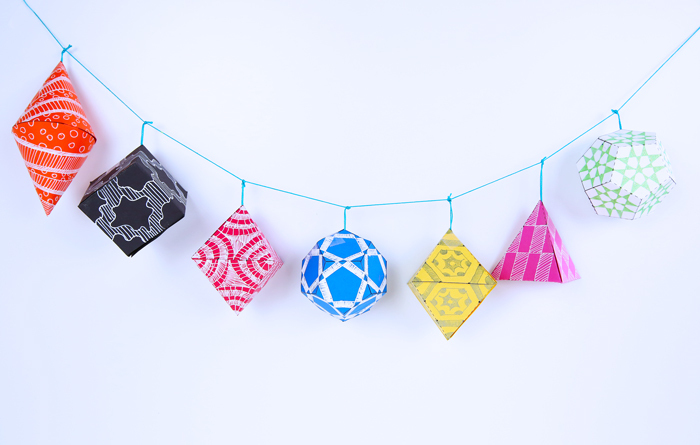 To make a garland tie the individual hanging shapes to a long string. If you don’t tie the knot too tight you will be able to slide the shapes gently along the string to space them out. Alright here’s the meat of today’s math lesson. 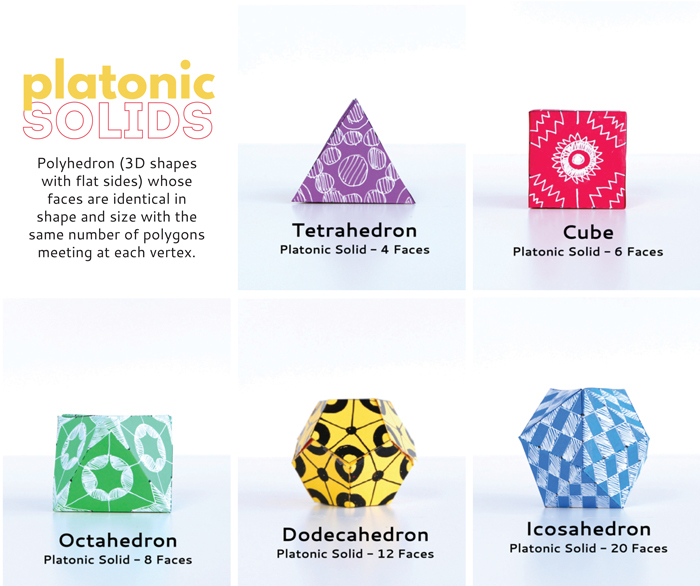 Just what the heck is a platonic solid? Polyhedron A solid 3D shape made of flat faces. 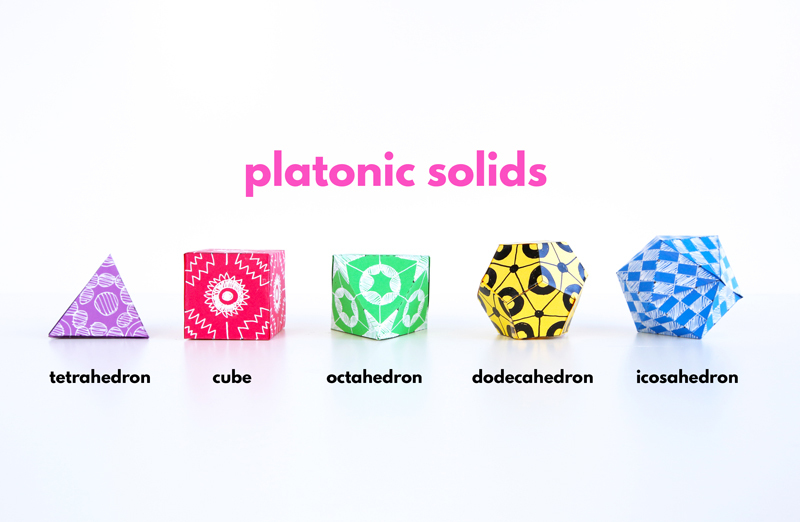 Platonic Solid A polyhedron with faces that are the same shape and size and with no indentations in the faces. That means that every face in these solids is identical and flat. Platonic solids are amazing because all angles are equal and all the sides are equal length PLUS at each vertex the same number of faces meet each other. Tetrahedron A tetrahedron has 4 triangular faces. Cube Probably the most recognizable Platonic solid, a cube has 6 square faces. Octahedron An octahedron has 8 triangular faces. Dodecahedron A dodecahedron has 12 pentagonal faces. Icosahedron An icosahedron has 20 triangular faces. Pyramid A polyhedron made from 4 triangles and a square base. 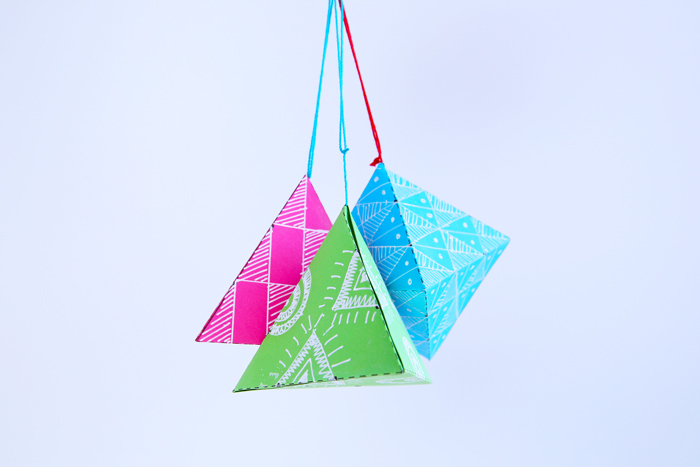 The triangles all meet at one point at the top of the shape called the apex. Cone A 3D shape that tapers from a circle to a point or apex. 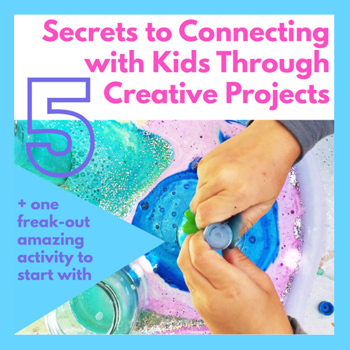 Art Now that you know the fancy math behind the complex shapes you are making have some fun creating artful patterns on them! A pattern as defined in art is an organizing structure for a composition. Patterns typically repeat in an organized way in drawings and designs. 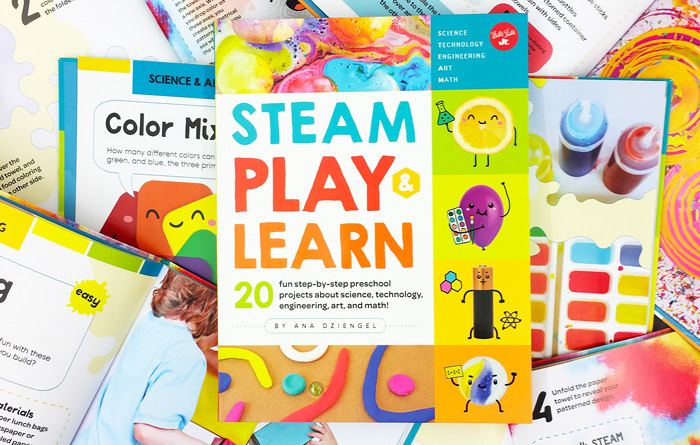 If you draw designs and patterns from the dots on the template you can create connecting designs that fluidly move around the final 3D geometric shapes. 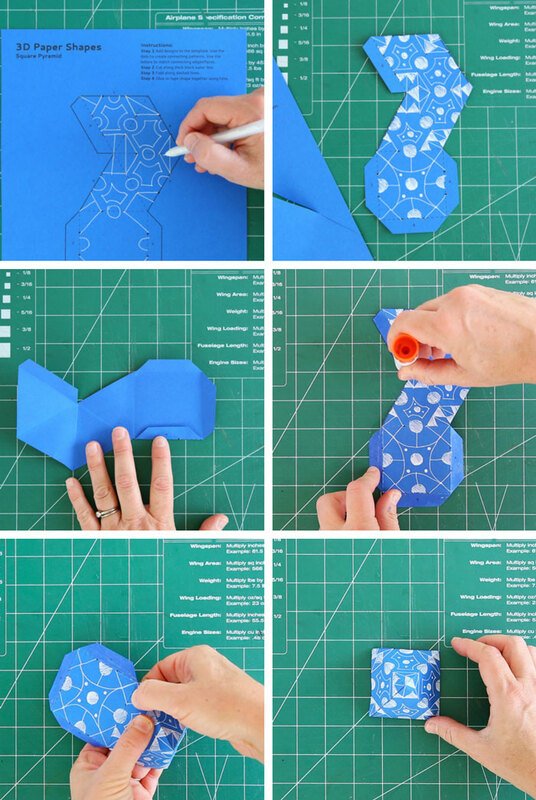 Experiment with your designs and watch how they change when folded into a 3D shape. Engineering This is a wonderful project to illustrate how strong sheets of a material can become when that material is bent and shaped. 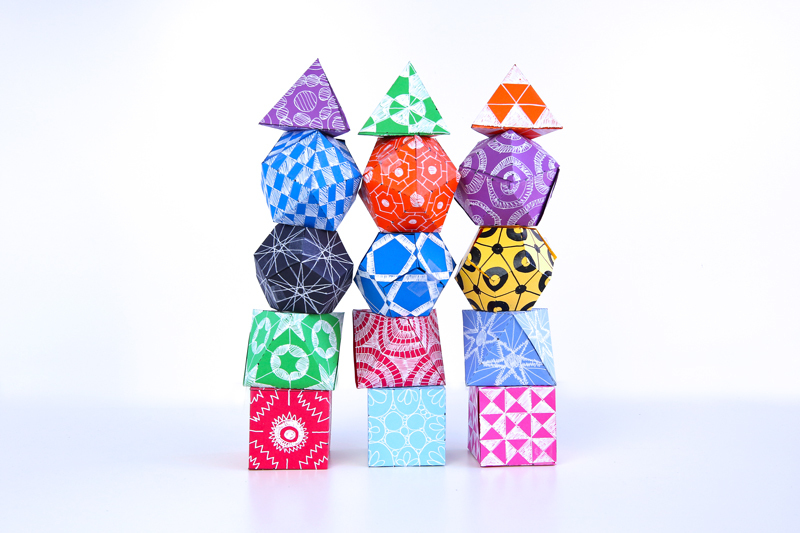 A sheet of paper is flimsy and can’t support much, but when folded into 3d geometric shapes it becomes quite rigid, can support some modest weight, AND can be stacked to create height. Many construction materials such as sheet metal are not very strong in sheet form but when bent into tubes, squares, and other shapes, becomes very rigid and structural. Wow! This has been a post full of info! I want to again thank Sakura of America for sponsoring this post and for letting me try out the new set of Gelly Roll White pen sizes. 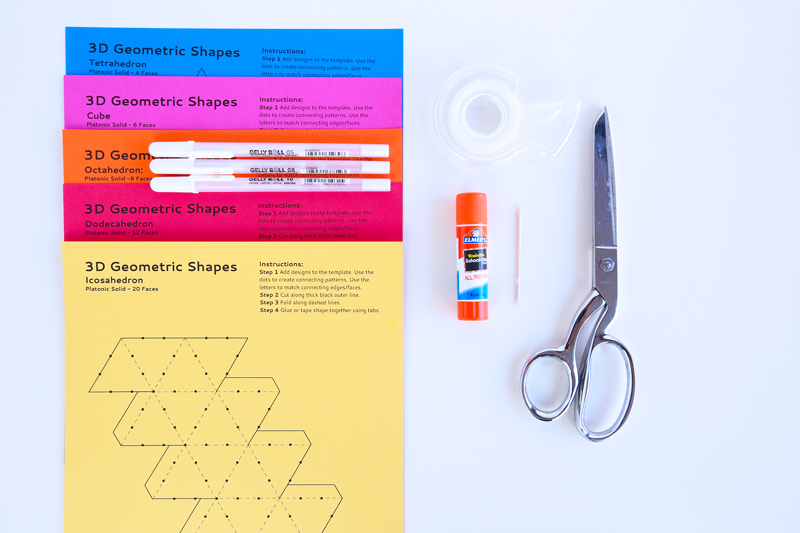 They were the perfect art supply to use on these colorful 3D geometric shapes.